You've found the “U.S. Java Chicken Breeders” page here at Hobby Farm Wisdom! If this is the first time you have visited our site: Welcome! The Java chicken breed is the second oldest breed that originated in America, having been developed from chickens of unknown Asian breeds. Despite its long history as the basis for many other breeds, today Java chickens are critically endangered. 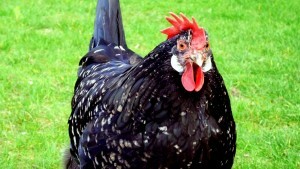 Java chickens are a hardy chicken that appears in three color variations, black, mottled and white. Their rectangular body shape and long back are their most distinguishing features. While they mature much slower than the broilers that are popular today, they do produce a solid carcass. Their hens will also produce a good amount of large brown eggs and often go broody. Java chickens are especially good foragers, requiring little to no supplemental feeding. With their docile temperament, they are an ideal breed for small homesteads or backyard flocks.